True to their word, we don’t hear a peep from the boys all night and they beat us out in the morning, but we are off by 9:45 - pretty good for us night owls. We make it the X miles to Wheeler in two hours and eat lunch. Contrary to my usual packing paranoia, I underestimated our food consumption and we are hungry, doling out the final rationed bites of salami and cheese. Coming down off the hidden trail we see someone at our old camp, peering at a map. “Is that the way to Jackass?” he asks. Yes, we say. His confusion makes us feel a little better about our own mistake. Near the outhouse we see a couple of big areas that have been trampled and uprooted since we were here 24 hours ago. The bushes rustle. Sure enough, Steve soon spots the fabled little black pig, to whom we will later give a death sentence. Another two hours and 4.3 miles to Bear Harbor, where we eat our last Clif bar and chocolate and say goodbye and thank you to the Lost Coast for the lovely sojourn. Back over the rolling hills for 3 miles to Needle Rock by 4pm, where a different host, Karla, is filling in. We return the rope and report Steve’s pig sighting. She frowns and says “I smell bacon - I’ll have to get someone down there with a rifle”. Steve and I joke about how much that pig could be sold for in a fancy restaurant in SF. Raised on only the finest meadows of the Lost Coast. For the gearheads: testing out my load in the Zpacks Arc Haul in prep for the JMT, Steve enjoying his birthday present of a Gossamer Gear Mariposa. Both were great. Driving up the dirt road is easier than the way down, and we head to Garberville/Redway, eager for some serious calories. Steve gets a burger and fries and I down a coffee milkshake. Then back down Briceland Thorn Road to my friend Michael’s parents, with whom we’ll spend the night. At dinner Michael’s dad Bill tells us about an expedition he and Michael’s mother Gayle took to the Lost Coast in 1981 when Michael was still inside Gayle’s belly. They were part of a group of environmentalists, local politicians, and nuns from the nearby Redwood Monastary scoping out the land for conservation. After many days of bushwhacking and following threads of old fire roads, they all made their way from Usal to Bear Harbor. According to Bill, the organizer, Richard G., spent most of the trip trying to locate Doug Bosco, who had somehow been misplaced. Wow, pretty cool to end the hike with a small bit of the living history of its creation! We decide that Wheeler is the campsite of minor accidents as the wayfinding mistake unfurls into other mishaps. First we wake to find that the Ursack has been breached! I had lazily tied it to a log for the night, instead of finding a tree to get it off the ground. Little rodent teeth marks are all over the outside of the bag, which held fast, but it seems something very small squeezed itself through the opening. So for my sloth we pay the small price of half a Clif bar. Ah well, not too bad, but then the Aeropress explodes coffee all over the table and most unfortunately, Steve’s forehead. Luckily it wasn’t fully boiling and he sports only a slight burn. Then he drops the Sawyer Squeeze filter in the stream and has to jump in to get it, soaking his shoes. We’re happy to leave Wheeler behind. Second try to Little Jackass. This 4.5 mile section of trail is more overgrown than between Bear Harbor and Wheeler but also filled with blackberry bushes, which yield enough ripe berries to keep us pleasantly distracted the entire hike. The trail climbs gently (once again up to 1,000 feet) until just before Jackass and then descends steeply into camp. More gorgeous wildflowers. As we come into Jackass we see an elk across the gorge from the outhouse, sitting placidly, holding aloft his huge head of antlers. It’s spectacular to see the whole crown rotate as he slowly turns to look at us. Wow! So that’s who’s been crushing the grass down into a bed along the trail now and then. 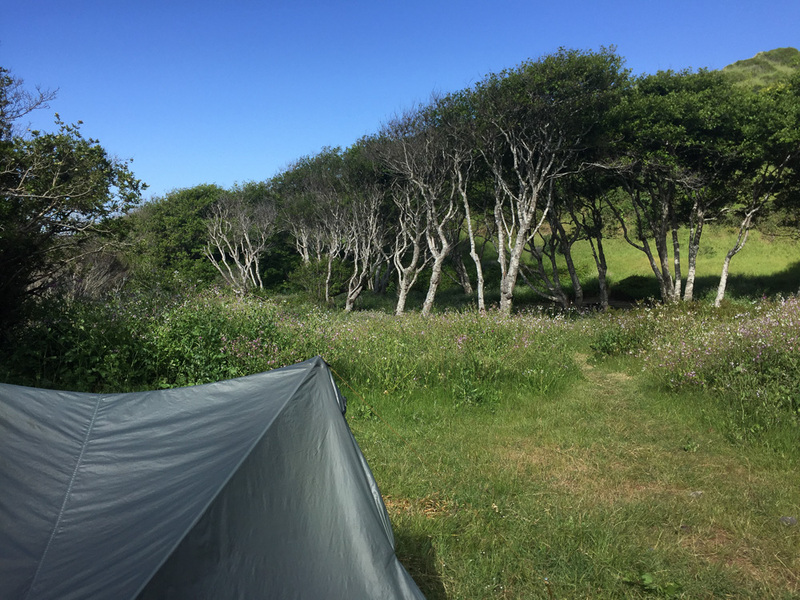 We head southeast along the trail at the outhouse, curious about the two camps supposedly inland, but after a ways without seeing them we turn around and head to the ocean. We pass through a camp right along the stream and settle into the next one, at the head of the beach. The seal spotting is spectacular. Soon a group of three very young men show up, possibly not even drinking age. They came from Usal and meant to make it to Wheeler but say they are more out of shape then they realize and might stay here. With their big packs and enormous cooking pot, no wonder they are tired! After we encourage them onwards with tales of the easy and beautiful trail ahead, they assure us that they will be very quiet tonight and we feel properly chastised for being seen as the old fogeys that we truly are. It starts to drizzle so we leave our driftwood by the fire ring for the next group and cozy into the tent to read a Kelly Link short story out loud and listen to the rain. We retrieve our intact hanging food from the camp across the stream and make breakfast. Steve in his grogginess pours his coffee grinds right onto the table - a foreshadowing of the more serious Aeropress misadventure to come! One of the camp hosts told us that he hopes they reopen the road to cars so that Bear Harbor is more accessible. We selfishly hope for the opposite - it’s incredible to be there alone. We enjoy a slow morning, waiting for low tide so that we can check out the tidepools. They don’t divulge as many treasures as we expect - a few starfish and anemones. When we arrive at Wheeler we head straight for the beach. After some good lounging on the sand under the sun, we are ready to keep going to Jackass. The map shows the trail heading south close to the beach, and a bigger road or trail above it to the east, but we are at the beach, and don’t see an obvious trail. When I had asked a friend who had been on this stretch about the possibility of doing a loop she said she hadn’t even noticed another trail. So we think it should be obvious and head back inland along the trail we came in on until we hit the outhouse nearest to the beach and a well trodden trail extending beyond it. The last printing of the map is in 2004 so we don’t think too hard about it, assume the map is wrong, and take the trail out from the outhouse, which quickly turns into a fire road. Enjoying the steady climb and the feel of our bodies, in sync, pushing upwards, it takes us a long time (embarrassingly, like 4 miles time) to realize our mistake. Whoops! The map is right, of course, and we are on the road to Usal that completely bypasses Little Jackass. Steve wonders about bushwhacking down to Jackass but it’s already after 5 and I’m not feeling being lost in the dark so we had back to Wheeler for the night. Besides my sore ego, we are fine and Wheeler is beautiful. The big open meadows near the beach could clearly hold a lot of campers and once again, we are grateful to have the whole camp to ourselves. We locate the real trail heading from the very southern corner of the accessible beach. It’s overgrown and hard to spot unless you are standing right in front of it, but it’s there! 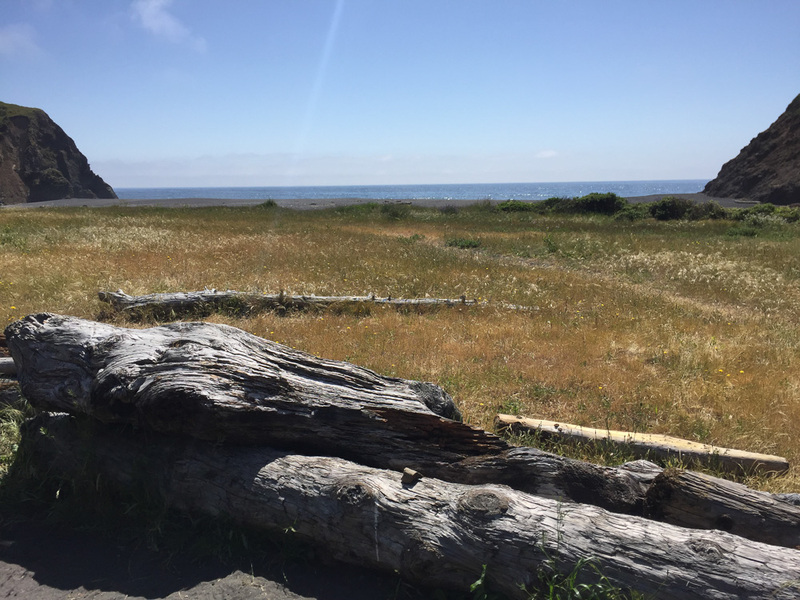 Steve and I drive into Sinkyone State Park on the Monday before Memorial Day weekend, both new to the Lost Coast. Sinkyone is named after the Sinkyone people who used to inhabit the land and continue to steward the surrounding area. The road is far worse than I expect for a state park, and I posit that the Needle Rock “Visitor Center” is a euphemism for “bulletin board” as we bump down the tiny dirt road in Zygote, my Honda Fit (R.I.P. Old Goat). Happily, I’m wrong and we pull up to a stately old house and two friendly camp hosts eager to share their knowledge of the local flora and fauna. Ticks are in season and can carry Lyme disease here, so they give us a sprig of pennyroyal to rub on our skin and clothes as a natural tick repellent. We smear it all over and take the sprig to help us identify more on the trail. We’re to watch out for escaped domesticated pigs that wreak havoc on the meadows, and rumored to be in the area. They also tell us about an elk who will be guarding her calf from a distance, and warn us to allow a wide berth. The camp hosts reassure us that the Lost Coast bears aren’t like Sierra bears and we can leave food in the car (with reasonable precautions like keeping it out of sight) and hang the food that won’t fit in the Ursack, big no-nos in places like Yosemite. They even lend us a bit of rope to that end. 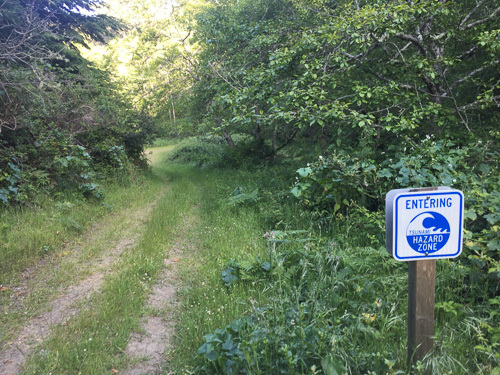 Bear canisters are not required, unlike in neighboring King Range National Conservation Area, the north stretch of Lost Coast. The 3 mile hike from Needle Rock to Bear Harbor along the recently closed road is easy and peaceful with wonderful ocean views and a taste of wildflowers to come. We see no one and are awed at the splendor of Bear Harbor. As we snack on a huge driftwood log a river otter comes down the river and we watch it flop its way into the ocean. Lucky. We make dinner and play rummy and then stay up watching the fire flame. The fee is $5 per person per night at the trail camps. You can self-register at the kiosk outside of the visitor center or go inside where there is a little station and you can get change from the camp hosts. There are currently no quotas, although with the new implementation of quotas on the Northern section, they are expecting even more crowds this Memorial Day Weekend (up to 50 parties camped at Wheeler) so there may be quotas in the future. We were told that summer weekends are variable - it could be mobbed or mostly empty. In any case, we feel grateful for our weekday vacation schedules. There is a faucet with running potable water outside of the visitor center - the camp hosts say that although the sign says it is not officially fit for drinking that it is triple-filtered and they have never had any problems, so we fill up. There are free state park maps at the visitor center in addition to the Wilderness Press Lost Coast map for $10. There are outhouses at each of the trail camps - the one at Bear Harbor is even equipped with toilet paper! (Don’t count on it). As you approach the water there are Hazard Zone signs at every camp - watch out for tsunamis! Fires are allowed as long as you either hike in bought firewood or collect driftwood. No other collecting of firewood is allowed. We found enough driftwood to have fires but I imagine after Memorial Day weekend the beaches will be picked dry. We’d considered a shuttle so that we could hike down the coast to Usal without returning but quickly ruled that out due to the added time and expense, which are considerable with the difficult road access. Nothing wrong with a good old out and back! We bring equipment too! Note the oxygen tank in the background. Thank you for the recent spotlight on birth centers - I wholeheartedly agree that they are an appropriate option for many families. I’ve worked in both birth centers and home birth and I take issue with only one line in the article. The author, Alice Callahan, implies that birth centers differ from home birth in that birth centers have “basic equipment on-site and a plan to transfer to the hospital if necessary”. Home birth midwives carry identical equipment and similarly transport when needed. The safety of both has been well established. In fact, almost every I midwife I know working in a birth center has also done home birth. Most, like me, go back and forth between the two environments over the course of their careers. There is no need to denigrate home birth to promote birth centers - they are both necessary components of any comprehensive maternity care system.